To get the Ipphone fully working make sure you have the latest phone firmware 6.1.5(a) that is possible to dowload using the link in linkografia. Att. : To log to the phone you need to get the IP Address of the phone: you can get it using the settings button, then pressing 9. Once you’re logged into the phone, we need to log in and switched to advanced: click Admin Login & after Advanced. Att. : Inside the zip file related the update there is a exe that upgrade the phone automatically: you have only to specify the IpPhone Ip Address ! Before launch the upgrade you have to set the Provisioning/Firmware/Upgrade Enable parameter to yes. 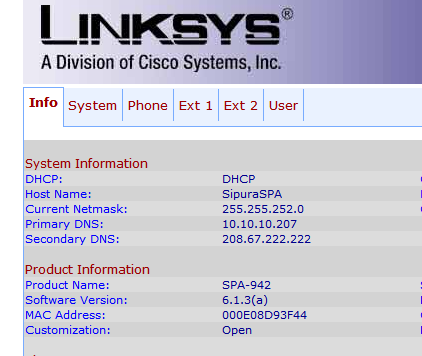 In Asterisk I have configured an extension (SIP) named Paolo, and with user 201 password paolo201: here the parameters in the Linkys SPA942 to use this account. Select the Regional tab, where I will set up the regional parameter related to Italy. Select the Ext 1 tab which will set up our first line. After that click on Submit All Changes. 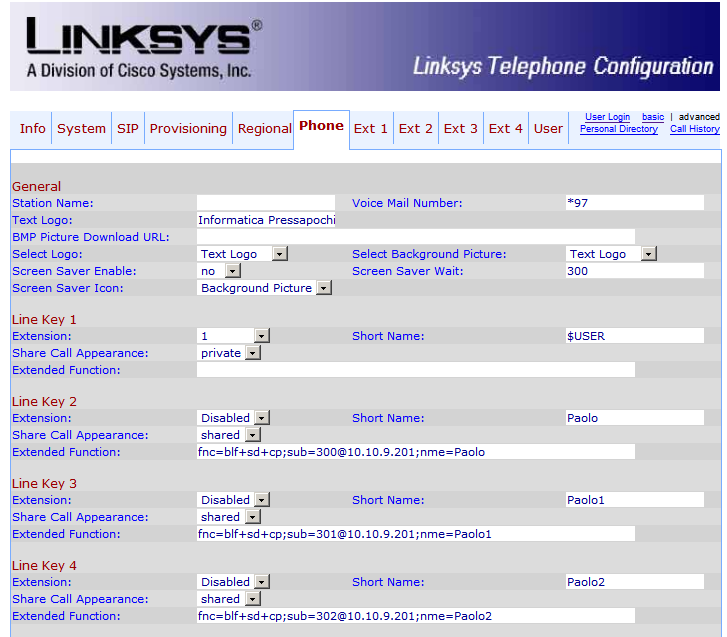 This entry was posted in Asterisk, Hardware, Voip and tagged Asterisk, Pbx in a Flash, PiaF, Sip, Voip by Giampaolo Tucci. Bookmark the permalink.